While not as creepy as the first one, this one plummets for full on horror with added jump scares. This is slightly disappointing as the creep factor was what made the first film so enjoyable but there is nothing here that horror fans won't have seen before. We are all used to the generic haunted houses with creaky floorboards and broken Victorian bric-a-brac. 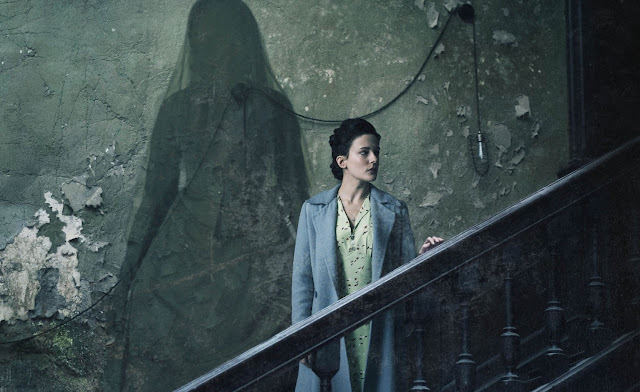 What this film does attempt to do is show us the Woman in Black's powers through the eyes of one of the children and the affects those powers have through the eyes of his teacher. Little Edward is usually a friendly little boy until his parents are killed when their house is destroyed in the blitz. With little time to grieve, he is sent away as one of the evacuees to Eel Marsh House but he hasn't spoken a word since his parents died. This would pose a problem with the continuing plot but the Woman in Black uses him to draw mildly creepy pictures and tells him things. His teacher, Eve, tries to comfort the boy which only ensures the anger of the ghost. She begins to attack Eve both mentally and physically while gripping tighter to the boy she wants. As soon as Edward reaches the house he begins to draw and the other students begin to do strange things as the ghost begins to kill them off. Their deaths are quite gruesome with one boy drowning when he is caught in barbed wire and a little girl suffocating herself with her gasmask. While these deaths are gruesome I felt they do fail to demonstrate just how powerful the Woman in Black actually is, surely she could do so much more? And that is another thing, for her own film, she gets very little screen time, appearing here and there but mostly being relegated to the background. She does get a few good moments like were Eve sees her as a nurse in one of her dreams, a scene which succeeded in making me jump and when all the characters are trapped in a dummy airfield and she turns out all the lights. During the first film, we hardly saw her away from Eel Marsh House, although we knew she was there but here she gets to travel far and wide. The airfield scenes are possibly my favourite bits about this movie as the ghost character really works well when she is away from the house. It also demonstrates that she isn't limited to one place like many ghosts in horror films, this one can follow you anywhere you go! But what this film fails to do is scare. Sure you get a few jumpy moments but they are nothing to write home about and it lacks the creep factor that you need. It does keep things interesting as it is based on the follow on book from the original novel written by Susan Hill, that people have probably never heard of. I urge you to read the follow on book as well as the original as they are both great reads!